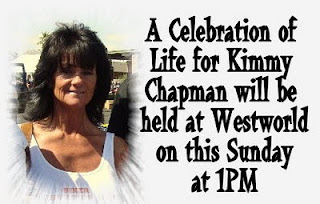 Arizona Bike Week will pay tribute to one of its greatest supporters, Kimmy Chapman at 1pm Sunday, April 3rd at WestWorld. Kimmy died at the scene of a motorcycle crash around 5pm Saturday, March 26th after spending her final day in life helping at a community fundraiser. Her life companion, Mark Tapp is at John C. Lincoln Hospital recovering from serious injuries. Kimmy helped to establish the rally and was the founding editor of Biker Information Guide -- a business she started in 1997 in Arizona that has expanded to 10 other states. She received the Arizona Bike Week "Hero" Award in 2009 for her years of dedication to the rally. "We want to thank each and every one of you for your thoughts and prayers," said Dave Shafer, media director for Biker Information Guide in a statement issued on the company website. "Kimmy had such a wonderful personality and everyone who knew her, loved her. She was someone that would bend over backward to help whenever she could. She was so full of life and it is so sad that we lost her. 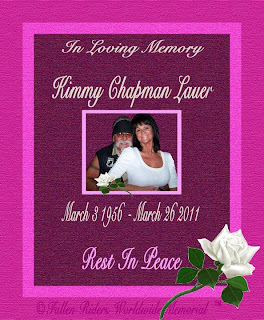 Her passion was Biker Information Guide and for that reason alone Kelly, Jim and I will continue to do what Kimmy loved doing. I’ve worked with Kimmy for over 12 years and there was never a better friend. I will truly miss her." Barb Heller of the ArmedZilla Angels American Legion posted this updated regarding an ongoing police investigation: I spoke with the Lead Detective Pitts on Kimmy's case, a bike rider himself, who is working on her case and keeping in close touch with Kelly and other family members. He feels he owes Kimmy's family a full and thorough investigation. He called in the state expert on impairment to investigate any signs of impairment of the driver and to provide them with the 'probable cause' needed to issue an order to draw blood. They found none. This state investigator is the same one working on the dump truck case from a year ago, which is still ongoing. He wants everyone to know that this is far from over and the only thing they haven't shown is 'criminal intent'. The police department can ONLY charge the driver with a 'Violation', such as in this case 'Failure To Yield'. Any other charges will come AFTER the investigation is through. Detective Pitts said that once everything is turned over to him to review, then it goes to the 'review unit' and then it is turned over to their Supervisor for Final Review and then passed on to the County Attorney's office. That is where the final charges will be filed if any. We need to stay on top of the County Attorney's office. Detective Pitts also said that he would be willing to come to any organizations meeting to explain the process and answer questions that he can at that time. Please contact Barb Heller at 602-505-8760 or ltlwtduv@cox.net to set this up. The crash one year ago in Phoenix - on March 25, 2010 - was so horrific that the president of the American Motorcyclist Association made a public statement of condolence to the families of the nine bike riders that were injured or killed when they were struck from behind by a dump truck while they waited for a light to change at an intersection in Phoenix. Read the story. There is an effort underway by Arizona A.B.A.T.E. and others to draft the "Kimmy Law" to establish felony charges and mandatory jail time when you violate the right-of-way that results in loss of life. Arizona currently does not have a vehiclular manslaughter law. 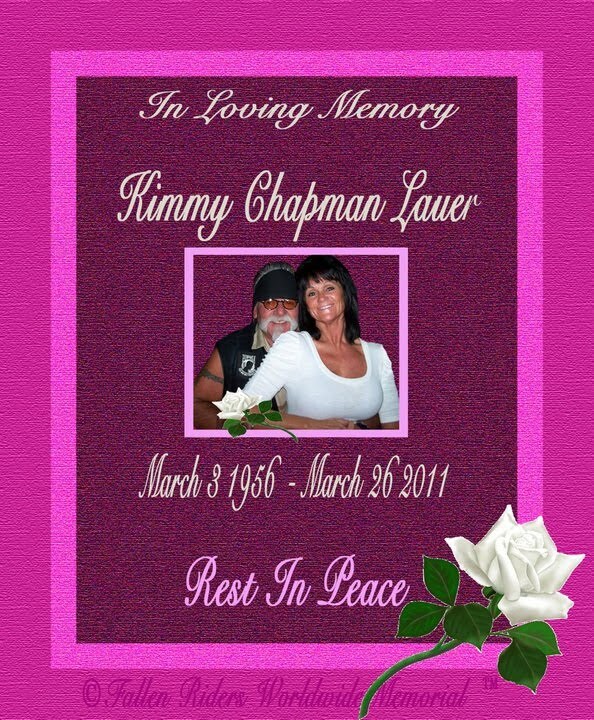 Maybe we should all act NOW and make a push for the Kimmy Law to be in forced NationWide! May you ride the clouds with sunshine always causing you shadow to dance.We shall see you again when we meet in heaven!!! Blanket protection is really needed because motorcyclists often travel to other states and probably have no idea they are taking huge risks that would financially devistate their family if they were killed on the roadways in some states that have week and/or unenforced violation of right-of-way laws. I will do all I can to support national legislation, so please keep me updated. It would be awesome if that legislation became known as the "Kimmy Law" to honor a woman rider who grew her own national francised business and poured her heart into charity efforts.